Edward Mitchell Bannister (ca. 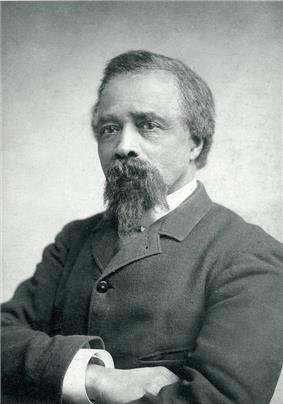 1828 – January 9, 1901) was a Black Canadian-American painter whose tonalism and predominantly pastoral subject matter owed much to his admiration for Millet and the French Barbizon School. Bannister was born in St. Andrews, New Brunswick and moved to New England in the late 1840s, where he remained for the rest of his life. While Bannister was well known in the artistic community of his adopted home of Providence, Rhode Island and admired within the wider East Coast art world (he won a bronze medal for his large oil "Under the Oaks" at the 1876 Philadelphia Centennial), he was largely forgotten for almost a century for a complexity of reasons, principally connected with racial prejudice. With the ascendency of the Civil Rights movement in the 1970s, his work was again celebrated and collected. In 1978, Rhode Island College dedicated its Art Gallery in Bannister's name with the exhibition: "Four From Providence ~ Alston, Bannister, Jennings & Prophet". This event was attended and commented on by numerous notable political figures of the time, and supported by the Rhode Island Committee for Humanities and the Rhode Island Historical Society. Events like this, across the entire cultural landscape, have ensured that his artwork and life will not be again forgotten. Although primarily known for his idealised landscapes and seascapes, Bannister also executed portraits, biblical and mythological scenes, and genre scenes. An intellectual autodidact, his tastes in literature were typical of an educated Victorian painter, including Spenser, Virgil, Ruskin and Tennyson, from whose works much of his iconography can be traced. Bannister died of a heart attack in 1901 while attending a prayer meeting at his church, Elmwood Avenue Free Baptist Church. He is buried in the North Burial Ground in Providence. The historian Anne Louise Avery is currently compiling the first Catalogue Raisonné of Bannister's work. See the International Foundation for Art Research for further details. E. M. Bannister Gallery at Rhode Island College is named after Bannister. Boston Street Scene (Boston Common), (1898–99). The Walters Art Museum. Romare Bearden and Harry Henderson, A History of African American Artists from 1792 to the Present, (Pantheon, 1993). The Vault' on Benevolent St. remains closed, for now"'".